Hair loss is also known as alopecia (or baldness), or medically speaking - androgenic alopecia. Alopecia means hair loss, and androgenic refers to the influence of male hormone in the process. I will explain later on. Many people think that baldness is a problem restricted to men, but actually affects women equally. The difference is that the hair loss in women is more discrete. To understand baldness (alopecia) you should in the first place understand the structure and the life cycle of hair. Fur and hair are cylindrical structures composed of proteins, especially keratin, which grow through the skin by from hair follicles located in the deeper regions of the dermis. The whole body, except the palms and soles, has hair follicles. They can be very thin and light and go unnoticed, but they are there. Hair has various characteristics and growth rate at different parts of the body, which is readily apparent when comparing eyelashes, hair, and pubic hair shaving, for example. Here we can see a representation of a hair follicle. The average scalp has 100,000 hairs, with an average growth of 1-2 cm per month. Every day approximately 75 to 100 hairs come out. Depending on the season, the stage of life and environmental factors, this number may increase. Anagen or hair growth phase. On average it takes 2-3 years and can reach up to 7 years. Catagen or phase of involution. It lasts only a few weeks, two or three on average. During this phase hair stops growing and the follicle begins to regress. Telogen phase or detachment. It lasts 3 to 4 months. The hair papilla is released and a new growth phase begins. As new hair grows, the old "dead" is pushed out of the hair follicle and falls. This process of growth and death occurs around the body with different speed for each type of hair. It takes hair a long time to grow before its big fall. This cycle explains why some hair never exceeds certain sizes and why even if it is never cut, it rarely exceeds the waistline. Of the 100,000 hairs on your scalp at this time, approximately 85% are in the growth phase, 5% in the phase of involution and 10% at the fall. 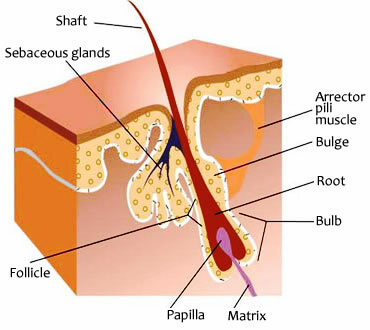 Baldness or alopecia is caused by a shortening of the growth phase (anagen), by a gradual thinning of hair and for reducing the size of follicles, making the root increasingly closer to the skin surface, as represented in the figure below. This miniaturization of the follicle is a process mediated by hereditary and male hormones. To be more precise, this problem is experienced by those patients, who overproduce an enzyme called 5 alpha-reductase, which converts the male hormone testosterone into a derivative called Dihydrotestosterone. It is genetic factors that determine this overproduction. Dihydrotestosterone binds to receptors present on some follicles causing a reduction of its size. Therefore, baldness occurs in individuals with a high level of dihydrotestosterone and numerous follicles with the same receptors. The different distributions of dihydrotestosterone receptor among individuals explains why we have different types of baldness. The figure below illustrates the most common patterns of hair loss in males. 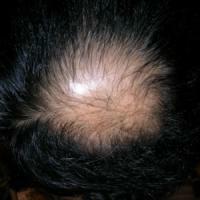 As far as women are concerned, androgenic alopecia is more diffuse over the scalp, however, it is less intense. Usually an intense thinning of hair happens, which occurs mainly in the center and apex of the head. Complete baldness, as in men, is rare in women. The solution for direct application of minoxidil into the scalp improves hair loss treatment by increasing the time of the anagen phase and stimulates the growth of miniaturized follicles. 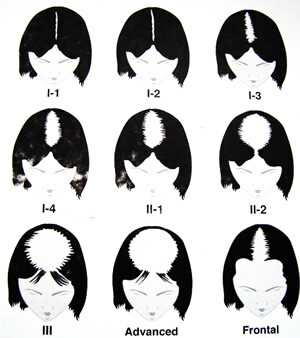 It takes at least four monthsto wait for some results, affecting the apex of the scalp more than the frontal region. The treatment is lifetime. With the interruption a person returns to hair loss. Finasteride is a drug originally used in prostatic hypertrophy but presented a side effect of a reduction in hair of the patients. This drug is a blocker of the enzyme 5-alpha reductase, which, as explained previously, prevents the transformation of testosterone to dihydrotestosterone (DHT), responsible for adverse effects in hair follicles. Finasteride (market name Propecia) occurs with the increase in the number of hair shafts, which also become thicker and stronger. Finasteride has not been proved effective for women and moreover it can cause fetal malformations. There is no evidence that the basis for laser treatments or other types of lights, well publicized in the media, are actually effective in preventing hair loss. One should resist the temptation to try miracle tonics. It can not only be ineffective but also speed up the process. Both finasteride with minoxidil have side effects and contraindications. There are several other causes for hair loss in addition to androgenic alopecia. So if you have hair loss, see a dermatologist, who will decide the best therapeutic strategy for your case. Anagen effluvium. It is the hair loss which occurs, for example, in chemotherapy, radiotherapy and mercury poisoning. Telogen effluvium. It occurs as a side effect of many drugs, vitamin deficiencies, psychological stress and thyroid disease. Traumatic alopecia. It occurs due to all kinds injuries to the scalp. It may appear after some smoothing techniques of hair with the same repeated traction associated with the use of chemicals. Alopecia areata. It is an autoimmune disease, where the body is mistakenly produce antibodies against their hair follicles. The scalp is most affected, but there may be loss of hair on any part of the body. You know I start suffering from baldness. I couldn't understand why it occurred. I haven't taken any drugs or vitamin deficiencies. Here it's said it’s because of stress. There are even some interesting facts about hair growth. I've read carefully the reasons and solutions. I haven’t caught yet what Minoxidil is. Is it gel? I’ll dug on this item. I have read the article carefully, but I haven't found the answer to my question: why the intense thinning of hair occurs mainly in the center and apex of the head. Why don't men start losing their hair on the face, in the area of mustuсh, beard and whiskers?